Fox’s Gotham is lucky enough to have access to the gallery of infamous rogues of Batman lore, but it’s no surprise that the show has already toyed with introducing the biggest bad of all Batman big bads with the Joker. Gotham has been careful to make the point that the Joker is more of a psychotic mindset than any one person at this point, so killing off Joker 1.0 Jerome didn’t mean that the character was gone for good. Now, Fox is bringing in Joker 2.0, and she looks fantastically crazy. Yes, "she." Joker 2.0 will be played by Tank Girl and Orange is the New Black actress Lori Petty. Gotham showrunner Bruno Heller has teased in the past that a female Joker was a definite possibility, and it seems that a Clown Princess of Crime is on her way to wreaking havoc in Gotham City sooner than we might have guessed. A woman in the role is somewhat unconventional, considering the famous portrayals by Jack Nicholson and Heath Ledger, but Lori Petty looks suitably unhinged in the iconic Joker makeup. 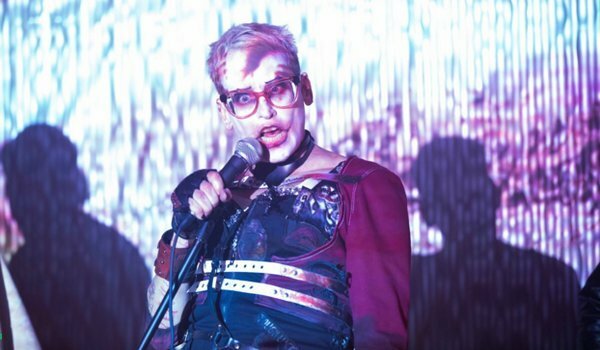 In fact, the makeup immediately sets Lori Petty apart from Cameron Monaghan, whose portrayal of the first Joker on Gotham featured the mannerisms and demonic laugh that many of us have come to associate with Batman’s arch-nemesis. We can’t say at this point whether Petty’s character has the makeup because the Joker persona is evolving or just because Gotham wants to give us another aspect of what makes the villain so unforgettable, but there’s no reason not to be excited about her. We learned earlier that Lori Petty would be playing a character named Jeri, who is a mysterious and extroverted hostess of a club where the patrons are fans of art as well as murder. Jeri will reportedly help young Bruce Wayne investigate his parents’ deaths but not feel quite so magnanimous toward Jim Gordon and the GCPD. Petty is currently set up to appear only in one episode, but if her version of the Joker is as successful as Cameron Monaghan’s, we can probably expect her to come back. Of course, that’s assuming that Jeri survives the episode, but Gotham hopefully will know better than to kill two Jokers in one season. Judging by the first glimpse of Lori Petty in the clown makeup, Jeri may be looking to kill on the standup comedy scene as well as on the club scene. Too bad Fish Mooney is still recovering from seemingly sleeping with the fishes to audition Jeri for her old establishment. Jeri may have a club of her own, but the level of crazy of Joker 2.0 vs. Fish Mooney could have been fabulous. Lori Petty will appear on Gotham in the March 14 episode, called “Wrath of the Villains: This Ball of Mud and Meanness.” Be sure to tune in at 8 p.m. ET on Fox to see how her version of the early Joker compares to those who came before.